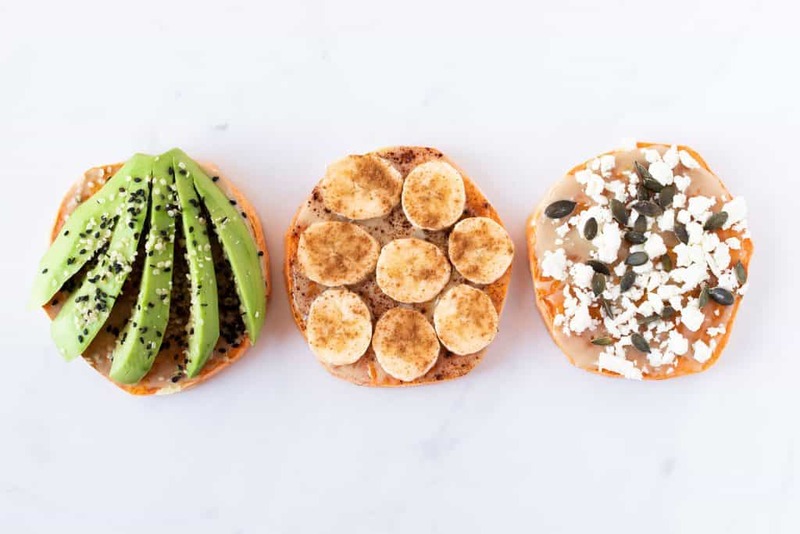 These sweet potato toasts are a healthy option and the perfect solution if you love toast, but want to start the day with a breadless breakfast. You can make a sweet or a savory version and they are suitable for a gluten-free and vegan diet. Finally, they are a perfect recipe to add to your Meal Plan. Sweet potato is an herbaceous perennial vine with edible tuberous roots. These types of roots are large and have the function to store nutrients produced in the leaves. It’s native to the tropics of Central and South America and has been cultivated for 8,000 years in what is now Bolivia and Peru. It is currently produced in several countries around the world that have a climate with mild temperatures. From a nutritional standpoint, sweet potatoes contain large amounts of starch, fiber, vitamins and minerals. Among the vitamins, the most relevant are provitamin A, and vitamins B1, C and E. The sweet potatoes with dark orange flesh are those that contain the highest amount of provitamin A. Among the minerals, the amount of potassium stands out. The sweet potato does not contain much protein, but has an important amount of lysine, which is one of the essential amino acids. Although they contain certain amounts of sugar (hence their sweet taste), they also contain a lot of fiber that slows down their absorption. Finally, both their skin and their pulp contain antioxidants. Thanks to its nutritional values, and the ease of cultivation and productivity, it is one of the foods used in the fight against malnutrition. In fact, in a 2005 study, it has been shown that the consumption of orange-skinned sweet potato improves vitamin A values ​​and is therefore considered an effective, long-term food strategy to control vitamin A deficiency in children. What do I need to make sweet potato toast? 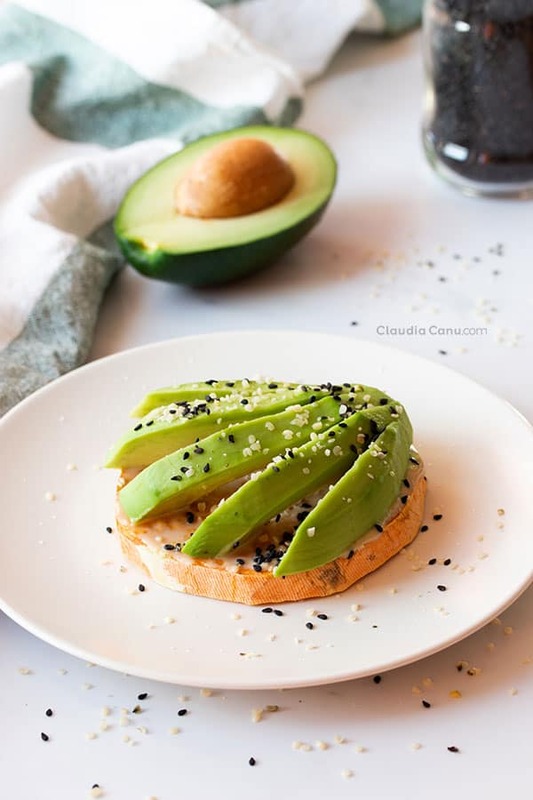 Other bloggers suggest preparing sweet potato toast by putting them directly in the toaster, toasting them three or four times. However, I think the best solution is to bake them and use the toaster when you want to reheat the ones that you stored in the fridge. So, the most important thing you need to prepare this sweet potato toast is an oven. Of course, you also need the sweet potato, which is the main ingredient and, for toppings, you can choose the ones that you like the most. Keep in mind, though, that there are as many possible combinations as you can imagine for bread toasts. First of all, wash your sweet potatoes well. I recommend leaving the skin on because it contains a lot of fiber. If you have already tried eating them with the skin, but you really don’t like it, then start this recipe by peeling the sweet potatoes. Depending on the size of your sweet potato, cut it into slices lengthwise or otherwise, depending on what size you want your toasts to be. Place the toast on a nonstick baking tray and bake for 20 minutes, turning them over after 10 minutes. When the sweet potatoes are toasted, remove them from the oven and add the toppings of your choice, exactly as if it were a toasted slice of bread. 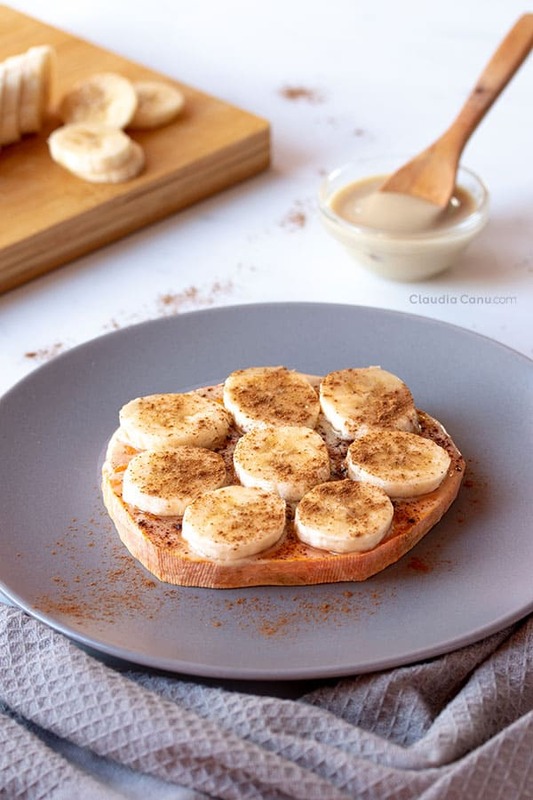 If you have added this sweet potato toast recipe to your Meal Plan, prepare the quantities that you need at once for the entire week and, once you take them out of the oven, wait for them to cool down completely before storing them. Once cooled, you can store them in a sealed glass container or in a Ziplock plastic bag. Every time you want to eat one of these pieces of toast, you can easily reheat it using a toaster. There are different types of sweet potato, however, the best ones to prepare this recipe are the ones with a firm orange flesh. When I was in Gran Canaria, I tried to prepare this recipe with the local white sweet potatoes, but when I stored the already-baked slices they turned black. Have a look at what type of sweet potatoes you can find in the grocery store and just make some to test before you choose the one you prefer. Finally, for sweet potato toast to be perfect, it’s important that you use a nonstick tray and remember to turn the toast after 10 minutes. In a 2007 study, antioxidant activities of sweet potatoes were studied in 19 different types. The result was that the highest total antioxidant activity was found in the violet flesh sweet potato and the lowest in the white flesh sweet potato. In a 2014 study, in which all of the literature on sweet potatoes was reviewed, it was confirmed that this tuber has high nutritional value. It’s a plant of great medicinal value with anti-cancer, anti-diabetes and anti-inflammatory properties. Finally, in a 2011 study, it was shown how the antiradical activity of sweet potatoes increases when they are baked or boiled. 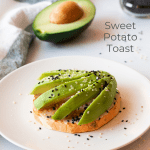 One of the things I like most about sweet potato toast is that I can add this recipe into my Meal Plan, because it’s very easy to store and it lasts for a whole week. As I mentioned above, before storing this toast, you have to let them cool completely, and then they can be stored in an airtight, glass container or in a Ziplock plastic bag that we use to freeze food. I don’t recommend freezing them. The easiest thing to do is to keep them in the fridge, then use them during the week. Every time you fancy one, simply toast it a few times in a toaster so that it gets hot and firm. The sweet potato crop does not resist cold and needs a temperate climate to grow. That’s why, depending on the region you live, sweet potatoes are an exclusively seasonal product and, often, it can be found in the grocery shops only during fall. This is also when the traditional recipes using sweet potato are made. However, nowadays, it’s possible to find sweet potatoes in some grocery shops during other times of the year. These products will no longer be locally grown, but will come from other regions with a temperate climate; for example, Malaga, the Canaries or countries of Latin America. 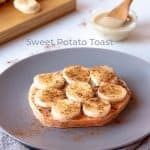 This sweet potato breakfast is very versatile and it’s perfect if you want to make a breadless breakfast, but don’t want to give up your toast. They are also ideal for a snack, and even for a post-workout snack. Finally, two or three pieces of sweet potato toast, depending on the size and the toppings, can easily make a lunch or a dinner. 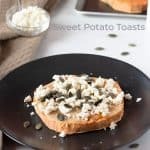 Can I make these toasts with different ingredients? Yes, yes and yes! As always, my invitation to you is to experiment with ingredients, especially with the ones that you like the most and that, in addition, keep variety in your diet. I’m looking forward to seeing your sweet potato toast on social media, so don’t forget to tag me. 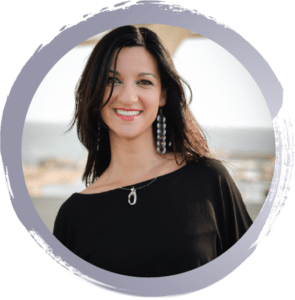 As always, I appreciate you stopping by my blog, and if you think this post might help someone you know to make another step to a healthier lifestyle, please don’t hesitate and share it away! Preheat the oven at 180ºC (350ºF). Peel the sweet potato if it seems that the skin is too irregular. When the sweet potatoes are roasted, remove them from the oven and add the toppings. You can follow my suggestion or you can use the ingredients you prefer, exactly as if you were preparing a bread toast. 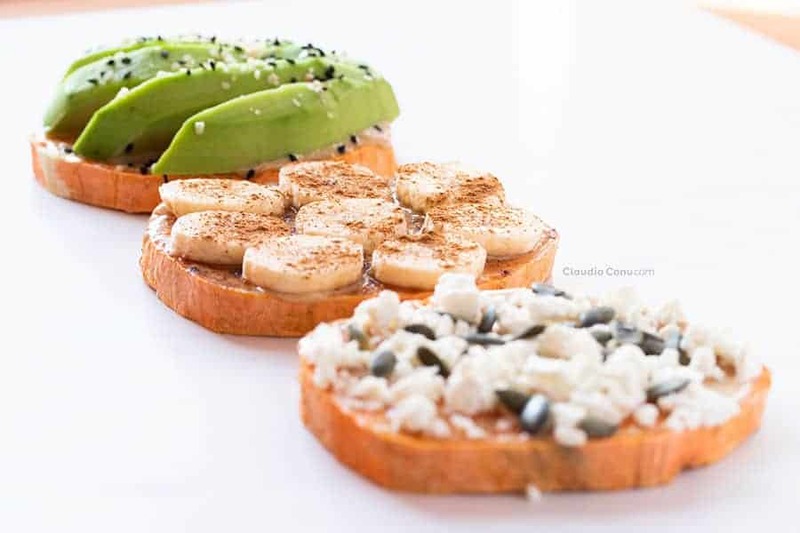 I have heard about sweet potato toasts and I am not sure why I have not tried to make them! My whole family loves sweet potatoes! I am putting this on my list to make this weekend! Another great recipe to have to ‘enjoy’ a certain product without actually including it into the menu! This will work great for my favorite savory breakfasts. And it is nice to know I can use it in so many other ways! 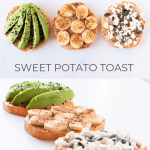 I love sweet potato but have never thought of using it to make toast! That is such a great idea! Can’t wait to try it! These look perfect! I just love all the fresh topping ideas you added to your sweet potato. Such a great meal idea. What a fun Idea, I have not come across this before, lordie knows why! It seems like such a simple and easy lunch idea. Always looking for breakfast variations! Thanks for this. 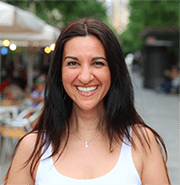 I’m a Health Motivator, I hold a master’s degree in Nutrition and Dietetics and I’m dedicated to making it easier for you to live a healthier life.